Alibaba Cloud Disaster Recovery (DR) supports warm standby, which acts as an extension of the organization's on-premise environment. During warm standby, a mirror environment offers a scaled-down version of a fully functional environment that remains running in the cloud. This minimizes the recovery time and enables mission critical systems to meet stringent RTO and RPO targets. 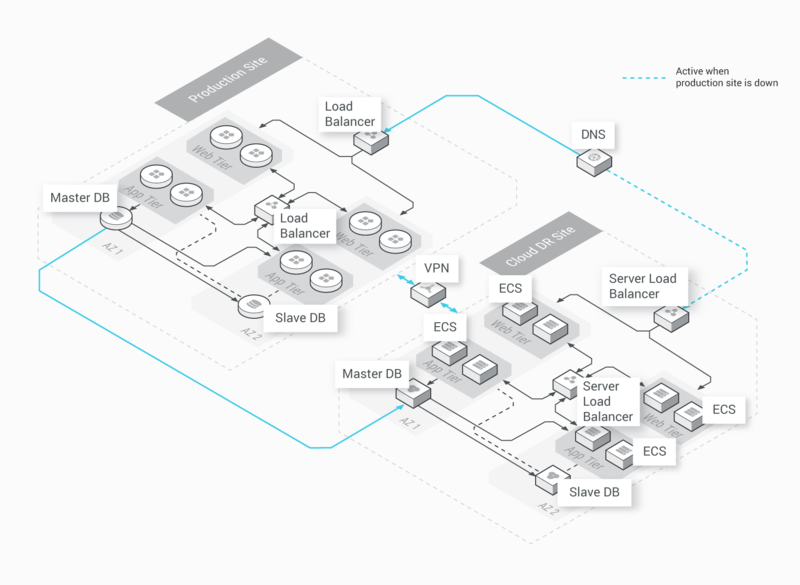 Embedded in this architecture is the production site and a common disaster recovery (DR) scenario called 'warm standby' or 'Cloud DR Site', which are connected via a Virtual Private Network (VPN). The warm standby is a scaled-down version of a fully functional environment that is always running in the cloud as a mirror environment and minimizes recovery time. The servers in warm standby run on a minimum-sized cluster of Alibaba Cloud ECS instances, and the DR environment is completely functional. In case of production system failure, the architecture scales up the standby environment for production load, and the DNS records change to route all traffic to Alibaba Cloud.